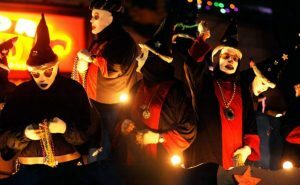 Join me as I sit down with my friend and Consultant for the Mystic Krewe of Druids, to learn a little more about them. JL: I know the Ancient Druids has been parading since 1998. How did it all begin? of Tequila and one thing led to another and Druids was Reborn. There’s more to the tequila story, but, I’d get in a bunch of trouble if I explained the whole story so I’ll leave it alone. So then myself and the original guy that had discussed the idea went to the City Council and we received a permit. And now it’s October and we have six members. JL: Has Druids always paraded on the Wednesday night before Mardi Gras? CMKD: Druids originally paraded as a marching group from around 1915-1921 and then paraded behind Rex from 1922-1935. So we took 65 years off and started parading on a Tuesday night until Hurricane Katrina. We were then asked by the City to move from Tuesday to Wednesday. JL: There is such a mystique and secrecy about the Krewe. Even the King who is referred to as the Arch Druid is never revealed. Why has the organization decided to remain so anonymous? CMKD: We just thought it would bring some fun back to Mardi Gras. Remember there were not that many parades on week nights. There were no Muses or Chaos when we started and Pegasus had moved to the weekend so Tuesday was open. And as far as the Archdruid. We know who the Archdruid is so that’s all that matters. Besides Mardi Gras has always been about secrecy and masking and every Club doesn’t want 3,000 members. JL: I also have learned that unlike most Krewes, Druids does not conform with tradition as far as staging a ball, nor naming a court, or a Queen. What is the reasoning for not participating in that type of pageantry? CMKD: Most of the guys are involved in other Clubs so we thought just having a parade would be best. How do you know we don’t have a Queen ? JL: The parade is always very controversial. The themes and float titles really push the envelope with poking fun at public figures, being politically incorrect, and taking puns at other Krewes etc. I know this first hand! LOL. What is the premise behind taking the parade to the extremes? Mystic Krewe of Druids sign takes a jab at female krewes in its 2015 parade. CMKD: That’s not us. You must be talking about someone else. JL: Do you think that the parade is misunderstood by some folks in the community? JL: Now I have to talk about the Druids/Nyx relationship. We have enjoyed some good Mardi Gras fun through the years. 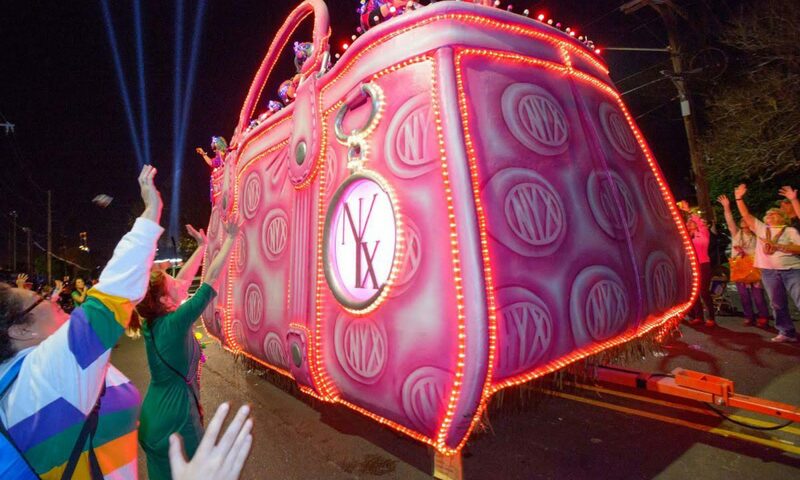 I have to take you back to Wednesday, February 15, 2012, which was the night of our first parade. I will never forget we were in the staging area where Druids members were walking to their floats raising their beers and cheering us on in the pouring rain. It really meant something for us to share your parade night and to be wished well for our first ride. And then……..…I heard about the last float in Druids that night. I was crushed! LOL! Then I realized this was going to be a lot of fun and “Welcome to New Orleans Mardi Gras.” It was a real baptism for Nyx. 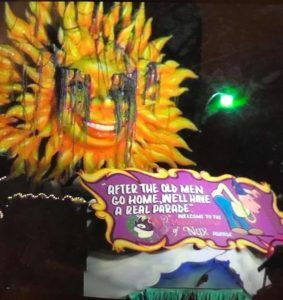 Tell me about the sign on the last float that night. CMKD: First we warned you that it rains two out of every three years, but, that is perfect Druids weather. I believe our theme was Druids Circus ? Can’t remember title of last float. I have selective memory. 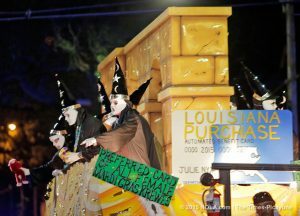 Sign on Druids last float in its 2012 parade. Like they say…if you can’t make fun of your friends…. 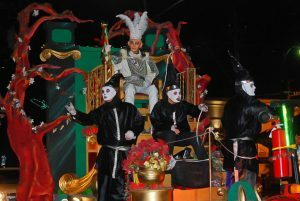 Druids float in its 2016 parade. I do remember a few of your riders seemed upset, but, I think they now know it’s all done in jest. I’m not sure if the media has figured that out yet which is really funny. JL: I’m glad that we enjoy a friendly relationship with the two Krewes. Don’t think that we aren’t ready for you year after year because we are! From the Druids walkers in front of our parade that you left behind a few years, to float signs and different titles, we are always have a come back for you guys to keep Druids on its toes. Other than poking fun at each other, how has having Nyx ride behind Druids enhanced your parade? 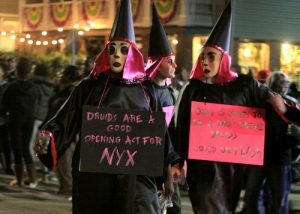 Nyx jabs Druids in front of its 2014 parade. 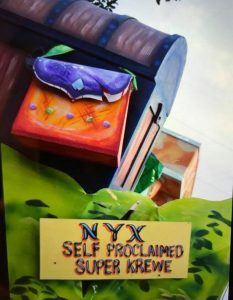 Nyx’s “Don’t be Cruel” float dressed like a Druid rider in its 2015 parade. 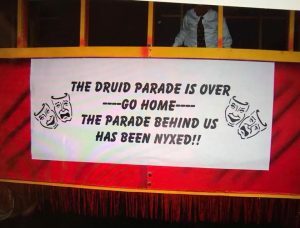 Nyx puts “Druids” riders who were left behind in front of their 2016 parade. CMKD: The good part is we now have people on the streets. The bad part is we now have to buy throws. Not a lot of throws. Nyx throws enough for the both of us. The 2019 parade should be a lot of fun. I think we are ready for ya’ll.